BlackBerry has been a very interesting stock to follow over the past few months. For years, the stock has struggled. However, recently a new product has regained investor focus on the stock. 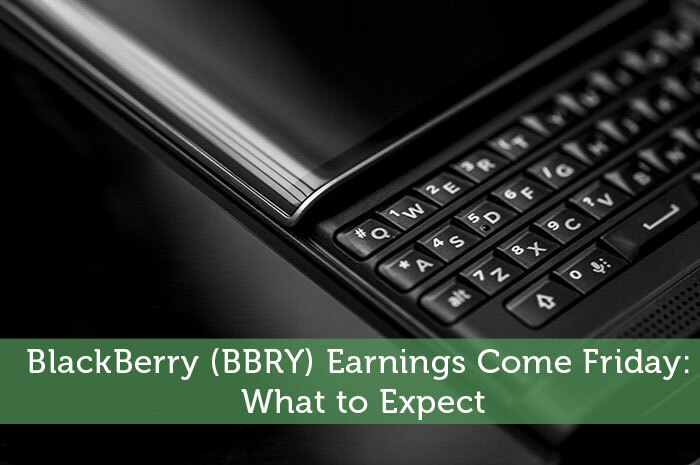 Now, earnings are expected to be released before the opening bell on Friday and BBRY is becoming a major topic of discussion. Today, we’ll talk about why BBRY had such a rough time, the big change they made, what we can expect to see from earnings and what we can expect to see moving forward. When you think of BlackBerry, what’s the first thing that comes to mind? If you’re like most people, you’re thinking about smartphones. In fact, it can be argued that BBRY was the company that led the way in smartphone innovation during the early years of the concept. However, as smartphones evolved, innovation led to better and better operating systems, and in this area, BlackBerry simply couldn’t keep up. As a result, their market share in the industry fell dramatically. Today, BBRY only controls less than 1% of the smartphone industry. This is what led to the massive declines we’ve seen on the stock over the past several years. Knowing that the primary problem the company has been having with smartphone sales is operating systems, BlackBerry made a crucial decision that may turn the stock around in a big way. They launched a smartphone called Priv. What makes this phone unique is that it takes advantage of both, the incredible hardware that BBRY is known for and the incredibly popular Android operating system. With this new product, sales of BlackBerry phones were likely to climb… and that’s exactly what happened. In fact, when Priv was released, deliveries were delayed because of the massive amount of orders that came in for the phone. According to NASDAQ, the consensus estimate with regard to earnings for the quarter is -$0.02. However, I have a bone to pick with this estimate. The reality is that this was the estimate before the Priv was released. No one knew how successful the product offering would be. Now that the Priv has been released, we know that sales went incredibly well. In fact, sales of the new smartphone were far better than anyone could have expected. As a result, I believe that earnings are going to come in above expectations. I’m expecting for earnings for the quarter to come in between $0.00 and $0.01 per share. Moving forward, I have an overwhelmingly positive opinion of what we can expect to see from BBRY. First off, I believe that the earnings report that will be released on Friday is going to be overwhelmingly positive. As a result, I’m expecting for this earnings report to act as a catalyst, sending the stock up dramatically in value. Also, beyond earnings, I believe that BBRY is likely to continue working on products that are associated with the Android operating system. Given the success of Priv, it only makes sense that the company would expand on the product line… leading to long run gains for the stock. Where do you think BBRY is headed and why? Let us know your opinion in the comments below! I’m long BBRY so I’m hoping for good things as well. The only thing I want to point out is that the Priv was released at the very end of the quarter, so they’ll only have a week or two worth of sales on the Priv in what will be announced. I would hope that if Priv is doing as well as many seem to think that the guidance numbers would be the ones that will be moved.